A recent change to the Boston Fire Prevention Code removes the requirement for furniture to comply with California Technical Bulletin 133 (Cal TB 133) in a fully sprinklered building. This change will have significant impacts to project teams going for assembly permits as well as building owners in the City of Boston. This change Impacts Assembly, Institutional, Educational, and Residential (except R-3 & R-4) occupancies. Align with MA State Building and Fire Codes and reduce flame-retardant chemicals that are known carcinogens. 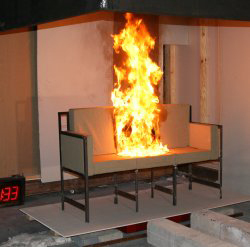 In 2015 when the new Massachusetts State Comprehensive Fire Code was adopted, reduced regulations regarding testing requirements for upholstered furniture in public spaces of fully sprinklered buildings were introduced. The previous edition of the code required this furniture to meet the testing requirements of CAL 133. The only way to meet the CAL 133 test standard is to introduce flame retardant chemicals which are hazardous to not only the occupants of the building but also the firefighters responding in the event of the emergency. The code change brought with it an allowance for meeting the CAL 117 test standard (which is less restrictive) for the spaces previously requiring CAL 133 testing. However, the Boston Fire Prevention Code still required the CAL 133 test method to be used for upholstered furniture in these spaces. Code change was adopted on 3/23/2016 and is expected to take effect around 7/1/2016. On March 23, 2016, the City of Boston adopted a change to the Boston Fire Prevention Code related to flame retardant chemicals in upholstered furniture. The adoption of this less restrictive test method allows for different furniture to be used that doesn’t contain these harsh chemicals and provides a safer atmosphere for the occupants of the building. This adoption provides designers with more flexibility and owners with financial savings when it comes to furnishing a building. The bill passed by the City puts the code change into effect in 90 days so look for these changes to take place around July 1, 2016. Now based on the new MA Fire Code, in sprinklered spaces, furniture is required to comply with CAL TB 117. If the assembly space is not sprinkler protected, compliance with CAL TB 133 is still required. Have questions on how this affects your permit applications or properties? Contact us with questions about the implications of this code change!